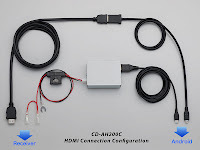 Pioneer Electronics has now listed the Android Connection Kit for AppRadio 2 (CD-AH200C) on its website. Could this mean an impending AppRadio 2 release? Maybe the first day of Spring which is a mere two weeks away. The kit can't be purchased yet though and no price has been mentioned. Since it has been listed separately, I'm guessing it won't be included with AppRadio 2. It will probably be an additional purchase. 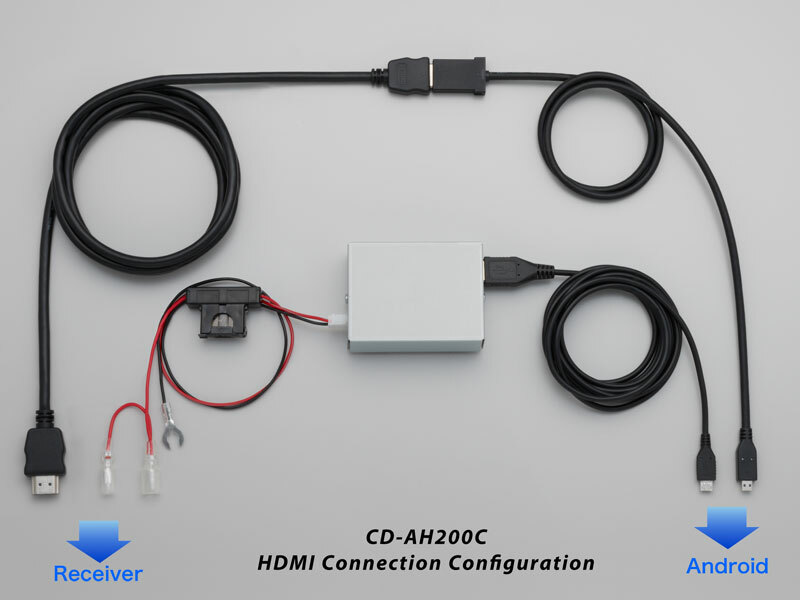 Use the CD-AH200C Android connectivity kit to connect a compatible Android™ device directly to the AppRadio 2 (SPH-DA100) for the ability to display and control compatible Android apps on the AppRadio 2's 7" capacitive touchscreen though Advanced App Mode. 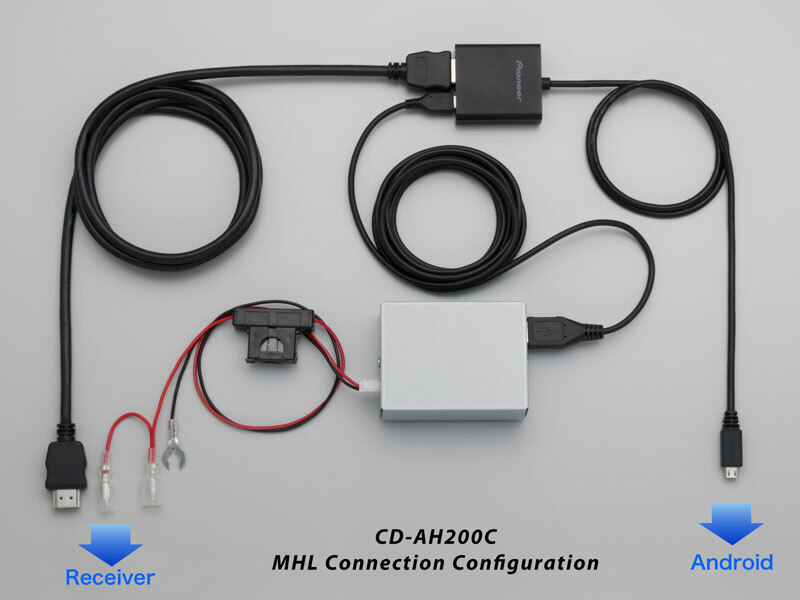 Depending on the application, either the MHL adaptor or micro HDMI cable adaptor will be used to connect the compatible Android device to the HDMI port on the rear of the AppRadio. The direct digital connection assures you get the utmost audio and video quality from your the media stored on Android device. 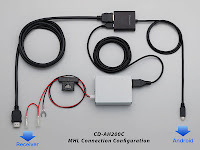 The included USB power supply and cable allow you to charge your Android device while its connected to the AppRadio 2. The CD-AH200C is compatible with the AppRadio 2 (SPH-DA100) and is required for Advanced App Mode functionality with compatible Android devices. From the description it seems like there will be two cables (MHL or HDMI) which will be used depending on the application and your Android device. There is also a USB cable for charging the phone. Sounds like a mess of cables. The iPhone cable, on the other hand, is a single 30-pin connector which supplies power and data connectivity ensuring a clutter-free setup. The other question is, will you still be able to retain the iPhone connection along with the Android kit? Probably yes, which means another cable to deal with in the car. More details will be available when the unit releases for sale, which is still listed as Spring 2012. Your phone needs to have a micro HDMI port or an MHL port which phones like the HTC Rezound and Samsung Galaxy S II have. Pioneer has said AppRadio 2 will work with "select Android devices". So if your phone is an older model without one of these ports it will probably not work. It's so stupid... If you're buying this radio over the iphone only one you obviously are running android. Don't charge me extra for cables on top of the 200 dollar premium on the radio. I agree. I hope the cables will be included with the stereo. I tried to hook up my EVO 4G with a Micro-HDMI to HDMI cable and got no connection. No apps showed, Pandora did not show. All the supported HTC phones on the Pioneer website have MHL connections, which the EVO 4G does not have.